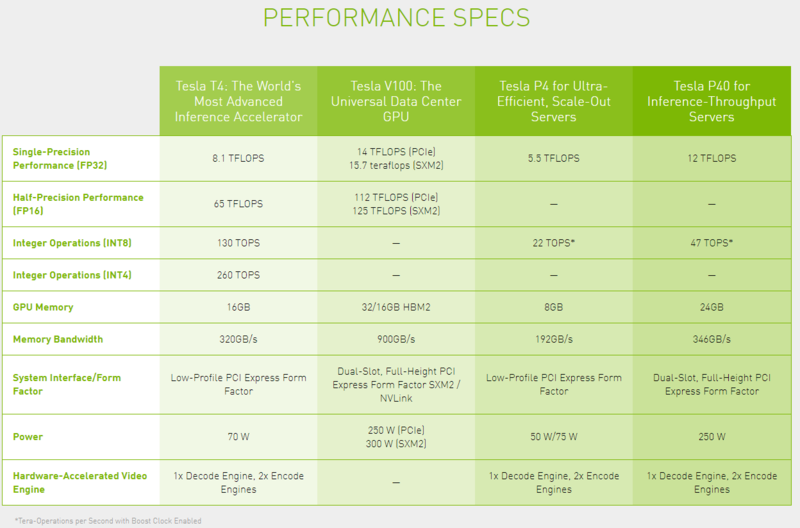 Google Cloud today announced that Nvidia’s Turing-based Tesla T4 data center GPUs are now available in beta in its data centers in Brazil, India, Netherlands, Singapore, Tokyo and the United States. Google first announced a private test of these cards in November, but that was a very limited alpha test. All developers can now take these new T4 GPUs for a spin through Google’s Compute Engine service. The T4, which essentially uses the same processor architecture as Nvidia’s RTX cards for consumers, slots in between the existing Nvidia V100 and P4 GPUs on the Google Cloud Platform . While the V100 is optimized for machine learning, though, the T4 (as its P4 predecessor) is more of a general purpose GPU that also turns out to be great for training models and inferencing. In terms of machine and deep learning performance, the 16GB T4 is significantly slower than the V100, though if you are mostly running inference on the cards, you may actually see a speed boost. Unsurprisingly, using the T4 is also cheaper than the V100, starting at $0.95 per hour compared to $2.48 per hour for the V100, with another discount for using preemptible VMs and Google’s usual sustained use discounts. Google says that the card’s 16GB memory should easily handle large machine learning models and the ability to run multiple smaller models at the same time. The standard PCI Express 3.0 card also comes with support for Nvidia’s Tensor Cores to accelerate deep learning and Nvidia’s new RTX ray-tracing cores. Performance tops out at 260 TOPS and developers can connect up to four T4 GPUs to a virtual machine. It’s worth stressing that this is also the first GPU in the Google Cloud lineup that supports Nvidia’s ray-tracing technology. There isn’t a lot of software on the market yet that actually makes use of this technique, which allows you to render more lifelike images in real time, but if you need a virtual workstation with a powerful next-generation graphics card, that’s now an option. With today’s beta launch of the T4, Google Cloud now offers quite a variety of Nvidia GPUs, including the K80, P4, P100 and V100, all at different price points and with different performance characteristics.